Heraldic flags include banners, standards, pennons and their variants, gonfalons, guidons, and pinsels. Specifications governing heraldic flags vary from country to country, and have varied over time. The pennon is a small elongated flag, either pointed or swallow-tailed (when swallow-tailed it may be described as a banderole). It was charged with the heraldic badge or some other armorial ensign of the owner, and displayed on his own lance, as a personal ensign. The pennoncelle was a modification of the pennon. In contemporary Scots usage, the pennon is four feet long. It tapers either to a point or to a rounded end as the owner chooses. It is assigned by the Lord Lyon King of Arms to any armiger who wishes to apply for it. The banner of arms (also simply called banner) is square or oblong and larger than the pennon, bearing the entire coat of arms of the owner, composed precisely as upon a shield but in a square or rectangular shape. The banners of members of Orders of Chivalry are typically displayed in the Order's chapel. Banners of Knights of the Order of the Thistle are hung in the 1911 chapel of the Order in St Giles High Kirk in Edinburgh. Banners of Knights of the Order of the Garter are displayed in St George's Chapel at Windsor Castle. From Victorian times Garter banners have been approximately 5 feet by 5 feet. Banners became available to all English armigers as a result of a report by Garter to the Earl Marshal dated 29 January 1906. The report stated that the size of banner for Esquires and Gentlemen should be considered in the future. Until that date they were available to all noblemen and knights banneret. In 2011, Garter Woodcock said that the banner for an Esquire or Gentleman should be the same size as a Marquess’s and those of a lower rank down to Knight, that is, 3 feet by 3 feet. In Scotland, the size of personal banners, excluding any fringes, are specified by the Lord Lyon. Standard of Sir Henry de Stafford, about 1475, features the Stafford knot and Bohun swan heraldic badges differenced with a crescent gules for cadency. The standard bears the Cross of Saint George for England. Black and red (sable and gules) are Sir Henry's livery colours. The heraldic standard appeared about the middle of the fourteenth century, and was in general use by personages of high rank in the two following centuries. The standard appears to have been adopted for the special purpose of displaying badges. "The badge was worn on his livery by a servant as retainer, and consequently the standard by which he mustered in camp was of the livery colours, and bore the badge, with both of which the retainer was familiar." Heraldic flags that are used by individuals, like a monarch, as a means of identification are often called standards (e.g. royal standard). These flags, more usually banners, however are not standards in a strict heraldic sense but have come to be known as such. A standard is not rectangular: it tapers, usually from 4 feet down to 2 feet, and the fly edge is rounded (lanceolate). In England any armiger who has been granted a badge is entitled to fly a standard. The medieval English standard was larger than the other flags, and its size varied with the owner’s rank. The Cross of St. George usually appeared next to the staff, and the rest of the field was generally divided per fess (horizontally) into two colours, in most cases the livery colours of the owner. "With some principal figure or device occupying a prominent position, various badges are displayed over the whole field, a motto, which is placed bend-wise, having divided the standard into compartments. The edges are fringed throughout, and the extremity is sometimes swallow-tailed, and sometimes rounded." Standard of the Leonese Monarchs during the Middle Ages (until the 13th century). It's one of the oldest heraldic flags; the documentation for the colours dates from c. 1150. The Oriflamme was the royal standard of the King of France during the Middle Ages. In Scotland, a standard requires a separate grant by the Lord Lyon. Such a grant is only made if certain conditions are met. The length of the standard depends upon one’s noble rank. An example of a standard suitable for a Scottish baronet (who is, in this case, also the chief of Clan Macdonald of Sleat). A Banderole (Fr. for a "little banner"), has both a literal descriptive meaning for its use by knights and ships, and is also heraldic device for representing bishops. Royal Banner of the King of Denmark in the 14th century, based on the Royal Arms of Denmark. 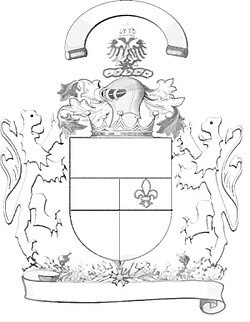 A gonfalone or gonfalon is a vertically hung banner emblazoned with a coat of arms. Gonfalons have wide use in civic, religious, and academic heraldry. The term originated in Florence, Italy, where communities, or neighborhoods, traditionally displayed gonfaloni in public ceremonies. The Scots guidon is similar in shape to the standard and pennon. At 6.5' long, it is smaller than the standard and twice the size of the pennon. Guidons are assigned by the Lord Lyon to those individuals who qualify for a grant of supporters to their Arms and to other individuals who have a following such as individuals who occupy a position of leadership or a long-term official position commanding the loyalty of more than a handful of people. The Guidon tapers to a round, unsplit end at the fly. A guidon can also refer to a cavalry troop's banner, such as that which survived the Custer massacre. The Scottish pinsel is triangular in shape, 2.5 feet high at the hoist and 4.5 feet in width tapering to a point. This is the flag denoting a person to whom a Clan Chief has delegated authority for a particular occasion, such as a clan gathering when the Chief is absent. This flag is allotted only to Chiefs or very special Chieftain-Barons for practical use, and only upon the specific authority of the Lord Lyon King of Arms. Wikimedia Commons has media related to Heraldic banners. Wikimedia Commons has media related to Heraldic flags. ^ a b Chisholm 1911, p. 312. ^ From a manuscript of 1603. ^ Burnett & Hodgson 2001, pp. 6–7. ^ Boutell 1914, p. 251. ^ "Custer's 'Last Flag' sells for $2.2 million". nbcnews.com. 10 December 2010. Retrieved 11 April 2018. Berry, W. (1830). Encyclopaedia heraldica or complete dictionary of heraldry. 1. London: Sherwood, Gilbert & Piper. Boutell, Charles (1914). Fox-Davies, A. C. (ed.). The Handbook to English Heraldry (11th ed.). London: Reeves & Turner. Burnett, C.J. ; Hodgson, L. (2001). Stall Plates of the Most Ancient and Most Noble Order of the Thistle in the Chapel of the Order within St Giles' Cathedral, The High Kirk of Edinburgh. Edinburgh: Heraldry Society of Scotland. ISBN 0-9525258-3-6. Chisholm, Hugh, ed. (1911). "Banderole" . Encyclopædia Britannica. 3 (11th ed.). Cambridge University Press. p. 312. Johnston, L. (2011). "Emperor Akihito and the heraldic achievements of the Garter". Lipskey, Glenn Edgard (1972). "The Chronicle of Alfonso the Emperor, The Poem of Almeria". Retrieved 15 December 2014. "The Court of the Lord Lyon - Further Guidance on Flags". lyon-court.org. Retrieved 3 March 2019. The Handbook to English Heraldry at Project Gutenberg, which is in the public domain in the United States. Fox-Davies, Arthur Charles (1976) . The Art of Heraldry (facsimile ed.). Arno Press. Nelson, Phil (1 February 2010). "Banderole". Dictionary of heraldic terms. OED staff (September 2011). "banderol[e] | bandrol | bannerol, n.". Oxford English Dictionary (Second 1989; online version September 2011. ed.). Earlier version first published in New English Dictionary, 1885.